Every now and then if you look out to sea, you may see something which is hard to believe. A large, white bird, hurtling at breakneck speed towards the water. If you have been a lucky witness to this, the bird you have seen is a gannet. These are the largest sea birds in Ireland with a wing span of just under 2m. The gannet species which frequents our shores is the Northern gannet. Ireland is actually one of the strongholds of this incredible avian, with ¾ of the world’s population breeding in Ireland and the UK. The three largest colonies in the country are at Little Skellig, County Kerry, Great Saltee, Co. Wexford and Bull Rock, Co. Cork. Little Skellig by far has the largest colony with over 26,000 nests. The birds are so proliferate here that the imposing rocks have what looks like a coating of icing. This is actually ‘guano’ or bird waste which scours out the rock due to its acidity. The birds nest here in large, smelly, noisy colonies. They raise one chick annually with their faithful partners. 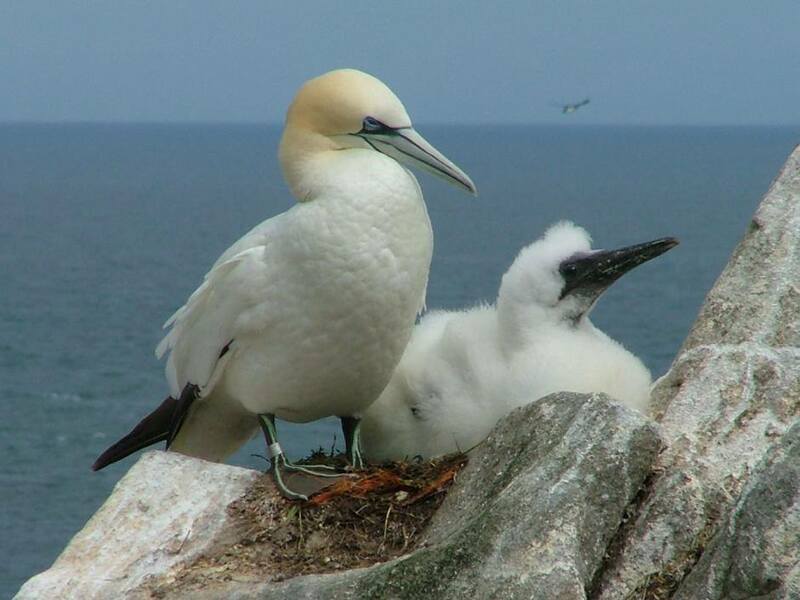 Gannets reach maturity between the age of 4 and 5 and will pair with another bird for multiple seasons and possibly for life. Chicks are fed semi digested fish when very young and this will change to whole fish as the chicks grow. This baby will not move about or flap its wings as it could fall from its precariously balanced cliff nest. It will leave its parents when it is 75 days old and glide down the cliff to the sea, never to return. Physically these birds have a dazzling array of features which morph them into torpedoes for their high impact sea entries. They have extremely acute eyesight and can spot a fish from 40m above the water surface. Once their quarry is spotted, they proceed to fold their wings back and pierce the water like an arrow. They can hit the water at 100km/h which could be fatal if wrongly timed. They have very thick skulls which act like crash helmets. Their throat also contains air pouches which inflate and function like an air bag to protect their bodies. They can even chase their fish down another 10m to seal the deal. 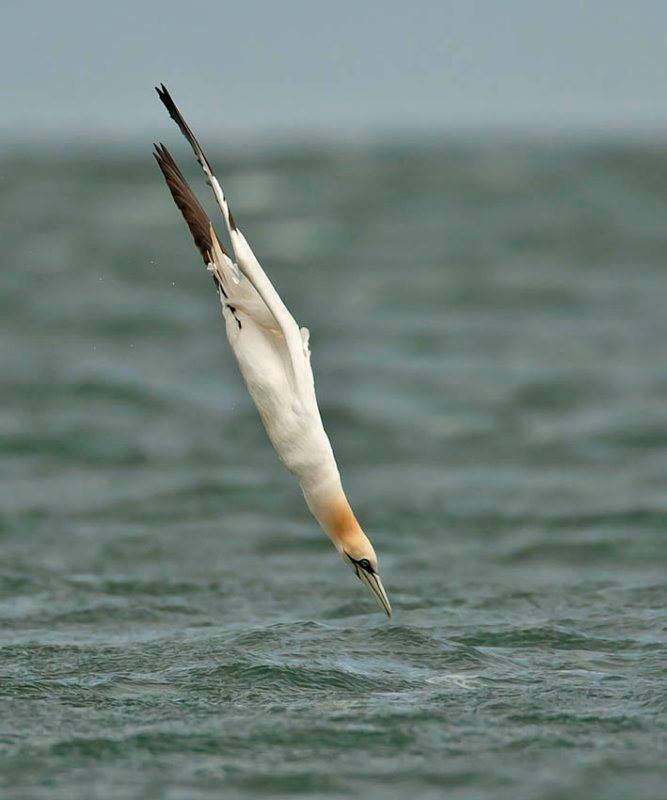 Even though gannet may be a byword for gluttony, would you really work that hard for your food?